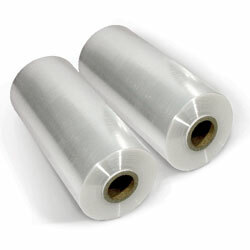 PVC shrink wrap film is the most economic and most popular form of shrink wrap. Used in conjunction with heat guns and shrink wrap machines, PVC shrink film is ideal for shrink wrapping smaller items such as DVDs, CDs, videos, books, electronics and toys. Excellent puncture and tear resistance makes PVC shrink wrap a perfect choice for wrapping even the most uneven products. As well as protecting against dust and moisture, PVC shrink wrap also acts as a tamper evident method of packaging boxed products. Please note, the rolls are centre folded - in other words, the roll width is half the size of the actual film (once it has been unrolled).